It looks like one of Intel’s marquee foundry customers just jumped ship. SemiAccurate has been saying that Intel’s vaunted 10nm process is not commercially viable, now we are seeing the first fallout. You might recall we have been saying there are two, not one, fundamental problems with Intel’s 10nm process. We told you about the first last December and the second a few weeks later. The problems are not tied together however, fixing one won’t necessarily, or even likely, mean the other is solved, and either one makes for a commercially non-viable process. You might recall the 10nm process is officially going great according to Intel PR, they talk about Icelake taping out, how they are not behind in Moore’s law because Hyperscaling redefined the numbers, and so on and so forth. One thing they won’t point out is that 10nm products are not out. They were supposed to be out more than two years ago and now, well, 2018. Maybe. And only on the lowest volume parts of the stack, “8th generation” is now overwhelmingly 14nm parts. 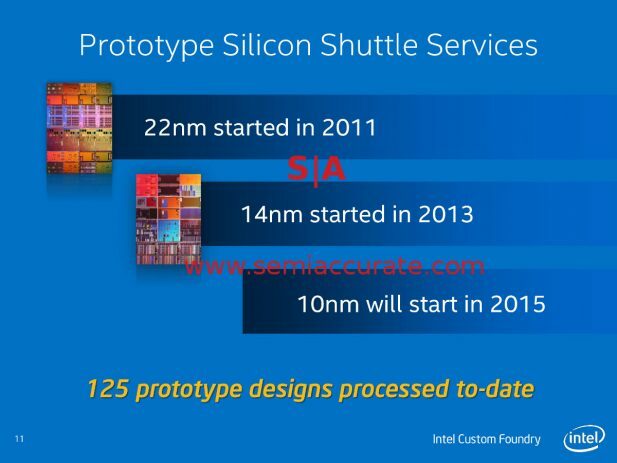 Does that tell you about how viable Intel believes 10nm is when (if?) it comes out in 1H/2018 as “planned”? Then there are the foundry customers, lots were announced. Altera would be the big one shipping if Intel didn’t buy them but there are others with silicon on the market. Netronome, Archronix, and Tabula seem to be the entirety of the list but together they don’t add up to more than a blip in Intel’s revenue. Remember Cisco and Panasonic? Cisco signed up in early 2013, Panasonic in mid-2014. Their Intel manufactured devices should be flooding the market now, right? Shall I go on? So Intel can’t make 10nm chips, has a customer list that can be counted on one hand, and the ones of those with financially significant volumes can be counted on one finger. Progress is being made though, and customers should be happy with the timelines Intel is promising. And delivering. Page 11 notwithstanding. Since the 2013/2014 announcements, several others, a few big names included, have officially signed on. This ‘wave’ was set into motion by ARM announcing they would be working with Intel as a foundry. Big names followed. One of the largest just left.